Unfortunately, with every case sealed, there are risks – for both the manufacturer and the recipient of the goods. Product damage, contamination and returns are associated with unsecure case seals that can pop open in palletizing, storage or transit, just as they can be attributed to the use of a knife to open cartons. An additional risk with the latter is worker injury, the costs of which can be astronomical. To minimize the risks, the FlexPack Taping System is armed with patented Folded-Edge® Technology, which folds the edges of the tape as it’s applied. This reinforces seal strength, particularly at the most vulnerable failure point – the edges where the major flaps meet the side of the carton – and adds reliability to the seal to keep contents protected from damage, contamination and theft throughout the supply chain. Another benefit of folding the tape edges is the creation of a ready-to-open seal that doesn’t require a knife or other sharp object. Essentially this creates a dry edge along the case seal, which can be grasped and removed by hand. 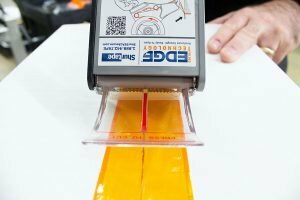 Additional safety features of the FlexPack Taping System include a bumper pad that provides added safety for users, and a retractable/pivoting safety blade on the hand-held tape dispenser. This design forces a deliberate cutting motion to engage the blade and shields users from accidental contact.